I’ve written quite a bit about black holes on this blog and elsewhere, including a peer-reviewed paper, though I’m hardly one of the world’s experts. Anyone who studies gravity has spent a lot of time studying black holes, since they comprise one of the first major results to come from Einstein’s general relativity that isn’t part of Newtonian physics. (Savvy readers may have heard of the “dark stars” of Lagrange and others in the 18th century, but these don’t really behave like black holes, despite superficial similarities.) So, when I got the list of forthcoming papers to be published in Science this week, I was really thrilled to see a new observation revealing the region right around the supermassive black hole in the galaxy M87. However, for reasons too boring to get into, I lost out on my chance to cover the paper for Ars Technica, so I’ll post what I wrote here instead. Update: John Timmer’s article on the same paper is also up. Thanks to years of observation, all but the most stubborn astronomers are convinced: black holes exist. Vast numbers of objects that are simultaneously too massive and occupy too little space to be anything except black holes have been found, both within our galaxy and at the cores of nearly every other galaxy. However, many details of black holes predicted by theory are difficult to confirm observationally, simply because black holes are too small relative to their masses. In particular, the event horizon—the boundary within which nothing can escape—is typically very small, so even our best telescopes have yet to measure one. Millimeter-wave observations lie on the boundary between microwaves and infrared light. Radiation of this type can pass through many regions opaque to visible light, including those occluded with gas. Since the central regions of galaxies are typically dense, millimeter-wave observations are very useful. On the other hand, the longer the wavelength, the larger the telescope must be to achieve reasonable resolution. That’s why the largest telescopes in the world are radio telescopes. To achieve even clearer pictures, astronomers link two or more telescopes into interferometers, where the light from each instrument is combined constructively. The telescopes acting together act in much the same way as a single telescope whose size is equivalent to the distance between them, so for really high resolution is to chain together instruments separated by many miles. This is the principle behind Very Long Baseline Interferometry (VLBI). The current study used four telescopes at sites in Hawaii (the James Clerk Maxwell Telescope on Mauna Kea), California (Combined Array for Research in Millimeter-wave Astronomy, or CARMA), and Arizona (Submillimeter Telescope) in concert to zoom in on the base of M87’s jet—the location of the supermassive black hole—using 1.3 millimeter-wavelength light. Together, this VLBI array is known as the Event Horizon Telescope (EHT), and as the name suggests, its eventual goal is to see as close to a black hole as is literally possible. At this point, I’ll break away from my Ars Technica article draft, since we need to understand a bit about black hole structure to see why this study is a big deal. The diagram below shows a rotating (or Kerr) black hole; the rotation makes the event horizon bulge out, but it also produces an interesting region known as the ergosphere. 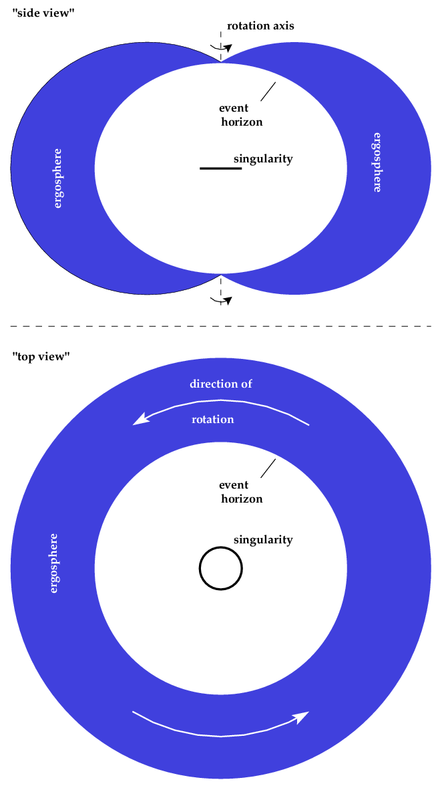 While the event horizon is the boundary of the black hole (being the point of no return), the ergosphere is a region where nothing can remain at rest, no matter how fast it moves. Part of the problem with this diagram is that it’s static. We should be seeing a dynamic picture: the presence of the black hole distorts spacetime around it in the manner of a whirlpool. What this means is that the natural paths of particles will bend in the direction of the black hole’s rotation. This is true around any rotating body, including Earth, and goes by the name frame-dragging. Think of it this way: rotation creates a kind of moving sidewalk, so even if a particle is standing still (so to speak), gravity will carry it along. Outside the ergosphere, particles can “walk” fast enough in the opposite direction to hold their position relative to a distant observer, just like you can walk fast enough to stay in one place on an airport moving sidewalk, relative to the pillars holding up the ceiling. (Suffice to say, I can be annoying to travel with sometimes.) Within the ergosphere, to stay in one place, particles would have to exceed the speed of light relative to the moving sidewalk of the black hole’s gravity. Ordinary rotating objects like Earth or the Sun don’t have ergospheres, but the Gravity Probe B satellite measured frame-dragging over a period of years. The results had pretty large error, but they did support the predictions of general relativity. The new observation of M87, however, provides stronger evidence for frame-dragging, even though the EHT didn’t resolve the ergosphere itself. Beyond the ergosphere, the metaphorical moving sidewalk still pushes particles to orbit in the same direction the black hole rotates. That means, for a particle to rotate in the opposite direction, it must move very rapidly relative to the sidewalk. The EHT results couldn’t resolve the actual disk of gas swirling around the event horizon, but the researchers measured 1.3 mm emission from a distance between 2.5 and 4 times the event horizon radius. To understand such a jet requires extensive theoretical modeling, involving the motion of charged particles, the magnetic fields they produce, and the back-reaction of the particles as they move through the magnetic fields (see my earlier post for a bit more on that)—all in the strong gravitational field near the black hole. The most likely model involves rapidly-orbiting gas known as an accretion disk, which funnels particles into a stream moving close to the speed of light—the beginning of the long jet seen in the picture of M87 above. However, for the base of the jet to be that close to the event horizon, the accretion disk must be small, and that’s where we get back to frame-dragging. If the disk orbited as quickly as the models predict in the direction opposite to the black hole’s rotation (as predicted by some models of jet formation) then it would have to be substantially larger than the ergosphere. This is because flowing opposite to the moving sidewalk of the frame-dragging requires a lot more energy than moving in the same direction, and closer in to the black hole—even well beyond the boundary of the ergosphere—that task becomes impossible. The EHT researchers found the base of the jet is too close in to the black hole to be driven by an accretion disk rotating in the opposite direction. Once again, we aren’t “seeing” the black hole’s event horizon, or even its ergosphere…but thanks to the EHT, we’re much closer to those goals than before. Additionally, high-resolution observations are now able to probe into the regime of very strong gravity, where general relativity hasn’t been fully tested yet. 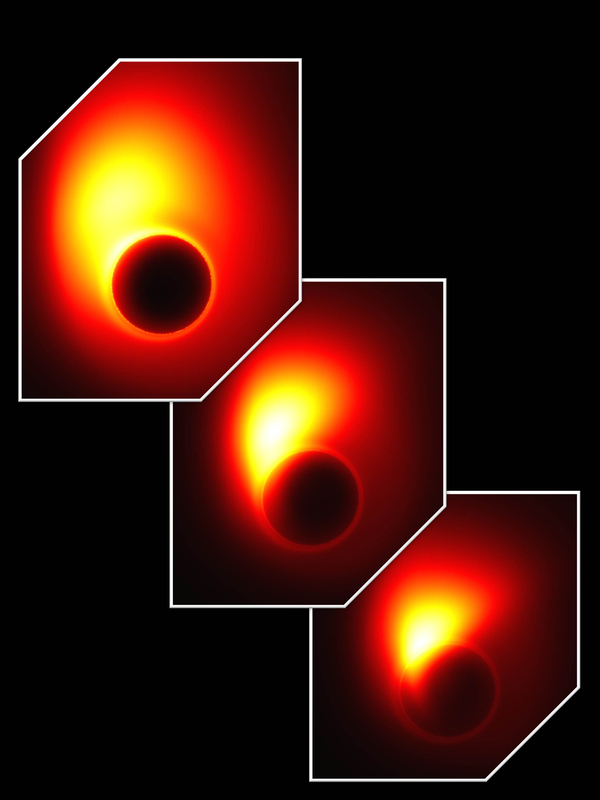 The frame-dragging aspects of the M87 observation still are consistent with Einstein’s theory, but if our model of gravitation needs modification, the region near the event horizon of a black hole may be where deviations from predictions can occur. I for one look forward to the next phases of observation, including the EHT’s planned proposal of Sagittarius A*, the black hole at the center of the Milky Way. Soon we may be able to verify some of the more esoteric predictions of black hole theory, and see deeper into some of the weirdest objects in our Universe. 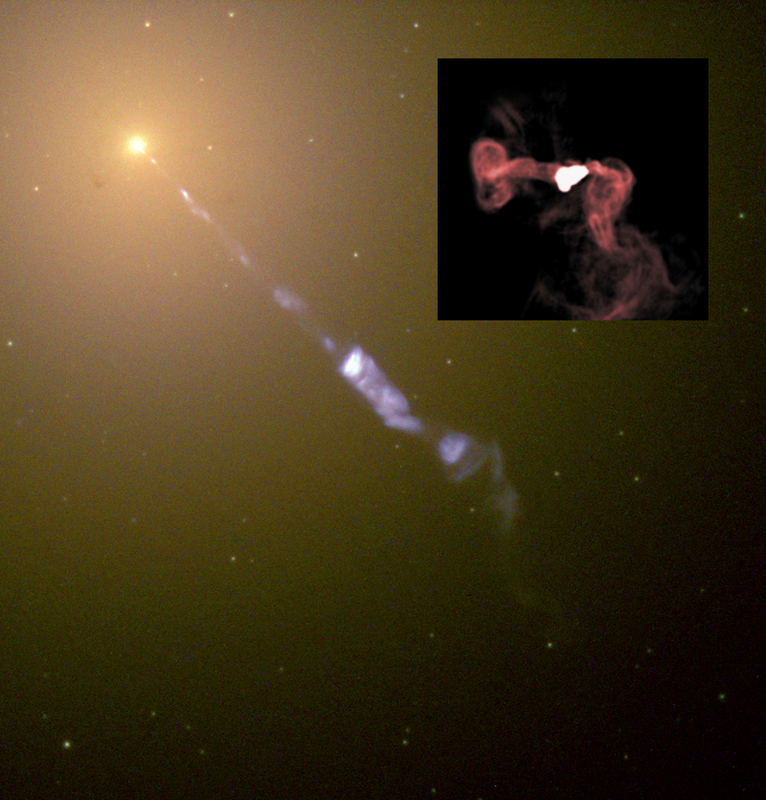 Update: The DOI link is still broken for some reason, so for those wanting to read the original paper (requires subscription or library access), here’s a link that actually works: Sheperd S. Doeleman et al., Jet-Launching Structure Resolved Near the Supermassive Black Hole in M87. Science 2012.